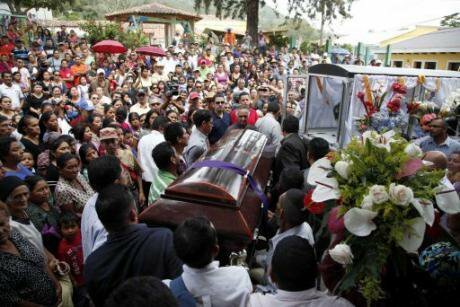 People carry the coffin of slain Lesbia Janeth Urquia, an environmentalist and indigenous rights activist, outside a church in Marcala, Honduras, Friday, July 8, 2016. AP Photo/Fernando Antonio. All rights reserved. Civicus, the non-profit organisation ‘dedicated to strengthening citizen action and civil society around the world’, has released its annual Civil Society Watch Report. The report documents serious violations of the freedoms of association, expression and peaceful assembly in 109 countries over the course of 2015, 14 of which are in Latin America. It presents a worrying trend. Despite calls to reverse the widespread closing in on the civil society space, it observes ‘more and more states are failing their commitments under international law and reneging on their duty to protect and enable civil society’. This has led to an alarming rise in the number of incidents of harassment, physical violence and targeted assassinations directed at civil society activists across the world – by both state and non-state actors. The report also claims ‘an alarmingly high proportion of [Latin American] countries exhibiting grave violations’. The vast majority of these violations concern failures to protect the freedom of association, with individuals and groups associated with Civil Society Organisations (SCOs) frequently subjected harassment, violence and, in several countries, killings. Latin American countries were also guilty of serious violations relating to freedoms of expression and peaceful assembly, with journalists and bloggers repeatedly appearing as targets of attacks. In spite of some formal progress observed at the legislation level, the reality is unsettling and a sense of regression is being felt across the region. Human and civil rights watchers must persevere in their scrutiny, efforts to protect activists from harassment and extreme violence must be pursued, and governments should be held accountable for their permanent violations on a permanent basis. The police used violence to break up protests by miners who wanted the government to address developmental problems in their region. Many CSOs resorted to self-censorship as a coping mechanism in the face of harassment against activists and organisations. NGOs were publicly named for being “irregular” and not complying with the registration law. There were numerous violations of the basic rights of journalists, protestors and civil society activists. Several indigenous peoples’ rights activists, bloggers and journalists were intimidated, violently attacked and assassinated. Protection mechanisms for human rights defenders failed as several activists were harassed through the courts and excluded from professional life because of their activities. In Southern Chile the police used disproportionate force against peaceful indigenous protesters, a group that was especially targeted. For instance, in September excessive force was used to disperse Mapuche community activists peacefully occupying a government building in the city of Temuco. Violent attacks and the murder of journalists, lawyers, community and religious activists and indigenous peoples occurred frequently, making Colombia one of the most dangerous countries in the world to be a reporter or a human rights defender. The structure of media owner - ship, and threats against journalists ─ especially those covering corruption, crime, human rights abuses, and elections ─ undermined the freedom of expression. Restrictions on all freedoms remained in place despite the reestablishment of diplomatic relationships with the United States. Security forces continued to harass and intimidate individuals and groups organised for political purposes outside of the Communist Party. All traditional media are state-owned, with no editorial independence, and internet access, although increased, still remains very limited. The use of short-term arbitrary arrests as an intimidation tactic against human rights defenders, independent journalists, political dissidents and protestors dramatically increased. The government attempted to shut down the website of the only remaining media freedom NGO in the country. It also increased its capacity to intercept digital communications while responding to escalating social protests with increased police pressure and by infiltrating demonstrations. Environmental and land rights activists faced a range of threats and attacks. The murder of a transgender activist highlighted the ongoing violence against human rights defenders. Specific targeting of women human rights defenders was also reported. The number of criminal violations against the media rose substantially. Protests against poor governance succeeded in removing the president who was accused of corruption. Violence, killings and intimidation of human rights defenders, journalists and trade unionists continued. Environmental and indigenous rights defenders were the worst affected. There was continued impunity for past crimes against human rights defenders as well as intimidation of prosecutors, judges and lawyers. There was an increase in crimes against journalists and civil society activists, especially LGBTI defenders and women human rights defenders. Although a law was enacted to protect human rights defenders, it was not adequately implemented and civil society was not widely consulted. The government was reported to have purchased spyware software. Civil society continues to face burdensome administrative requirements. Journalists active in denouncing human rights abuses and drug trafficking were killed. The government was reported to have purchased surveillance software threatening privacy rights. Eight human rights defenders were assassinated, and many others, particularly advocates for indigenous people’s land rights, suffered judicial harassment, physical attacks, threats and intimidation. Women human rights defenders were reported to be at particular risk. Two human rights defenders were assassinated and media self-censorship was rampant due to fear. A draft law was proposed to create a state company to manage broadband services. The Sovereign Security Act, which greatly expanded the definition of security threats, came into effect. Government informed CSOs that they would not be able to directly receive funding from international sources but only through government institutions. Several protests, including some against the Interoceanic Canal megaproject, were repressed. Human rights defenders working on environmental, indigenous peoples’ and land rights issues faced physical attacks, threats, intimidation, and smear campaigns. Women human rights defenders were specifically targeted. HRDs also faced suspension from professional associations for their advocacy work. Protests, particularly those by unionised workers and peasants, were repressed by police. Requirements for renewal of NGO registration were modified and reporting duties and controls were increased. Socio-environmental protest increased, and a state of emergency was declared in three provinces following violent clashes with police. Human rights defenders, particularly those opposing extractive industries, were targeted. Women’s rights advocating for sexual and reproductive rights were also at risk. Activists and journalists were harassed and criminalised, with regular public allegations levelled by senior government officials that they were working for foreign powers to destabilise the state. CSOs cooperating with UN and Inter-American mechanisms were especially harassed and accused of conspiracy. In reaction to protests in 2014, a decree allowed security forces to use deadly force against demonstrators. There were numerous significant violations of the freedom of expression. The findings of this report align with growing concerns that structural violence continues to engulf much of the region. While there are positive signs that violent conflict can be tempered, most notably from those around the negotiating table in Colombia, there are still major failings on the parts of Latin American states to protect the people that are active in the civil society space. While the countries of El Salvador, Guatemala, Mexico, Nicaragua, Brazil and Colombia display the most violent forms of repression on CSOs, major restrictions and social pressures on the basic freedoms highlighted in this report remain a challenge for the region as a whole. The report covers 2015, but in the first half of 2016 we have seen the situation deteriorate significantly in Honduras, and we have witnessed disturbing developments in Argentina, a country to watch closely this term. The responsibility therefore lies on all states in the region to work towards reversing this trend towards a shrinking civil society. If they do not, we will witness the silencing of those in society who so desperately need a voice.